I'm a big fan of novels & aside from the parenting-related books I've read in the past six years, fiction has been the bulk of the books I've read. I am a sucker for a good biography though, so when this one popped up in my feed, my interest was piqued. 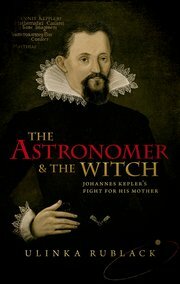 The full title is interesting enough: The Astronomer & the Witch: Johannes Kepler's Fight for his Mother. In case you didn't know, Kepler lived in the 16th & 17th centuries in & around what is now Germany. He is still a world renowned scientist, mainly famous for his contributions to astronomy, including the discovery that planets move in ellipses. He was a brilliant man who I think would have been a fascinating dinner guest. What interests me most about the book is how it illustrates mores & the culture of the time, while contextualizing Kepler's life politically & socially. His great love seems to have been studying the stars, but it's worth noting that this was actually a far more encompassing science in his day, astronomy & actually astrology were thought to be closely connected to human life, predicting personality, life events, & even health outcomes. Because of Kepler's fame, & probably not a little because of his tendency never to throw anything away, there are many well-preserved soures of information about him, which allows the writer to go into great detail on Kepler & his family's life. I've really enjoyed learning what the world was like during his time, particularly for women like his mother, who was accused of witchcraft at a time in history when tens of thousands of women & men were executed for this crime. The author, Ulinka Rublack, does a masterful job at detailing the impact of the witch trial on Kepler's whole family & even the community. I won't tell you any more about the book--you should go read it. Illustrated with the occasional drawing, map or photograph, & coming in at just over 300 pages, it's an engaging read. The Astronomer & the Witch: Johannes Kepler's Fight for his Mother, by Ulinka Rublack, Oxford University Press.